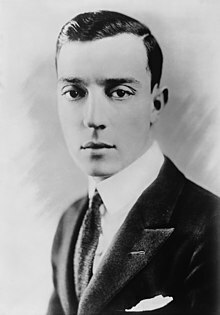 Joseph Frank "Buster" Keaton (October 4, 1895 – Februar 1, 1966) wis an American actor, director, producer, writer, an stunt performer. ↑ Meade, Marion (1997). Buster Keaton: Cut to the Chase. Da Capo. p. 16. ISBN 0-306-80802-1. This page wis last eeditit on 29 Mey 2017, at 03:13.